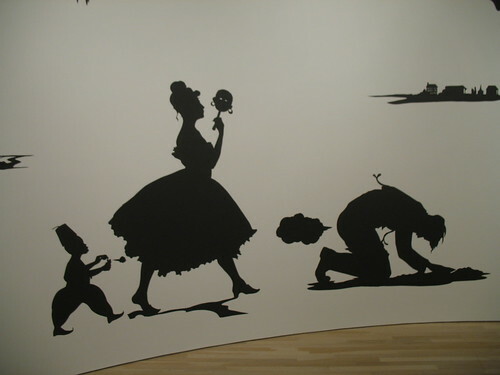 tater, R, and I went to the Hammer Museum tonight for the Kara Walker exhibit. Leave the kids at home, folks. Ms. Walker has a penchant for penises, poo, and profanity. But her work is not scatological without purpose. She has created a poignant body of work that addresses the very heart of human experience, notions of racial supremacy, and historical accuracy. 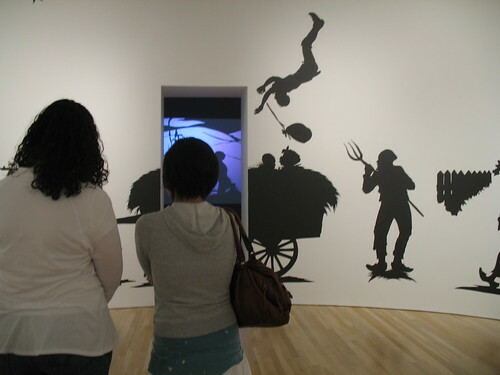 The exhibition, the first comprehensive grouping of the artist's work to date, features paintings, drawings, collages, shadow-puppetry, light projections, and video animations that offer an extended contemplation on the nature of figurative representation and narrative in contemporary art. Drawing her inspiration from sources as varied as the antebellum South, testimonial slave narratives, historical novels, and minstrel shows, Walker has invented a repertoire of powerful narratives in which she conflates fact and fiction to uncover the living roots of racial and gender bias. Really interesting and impressive stuff. 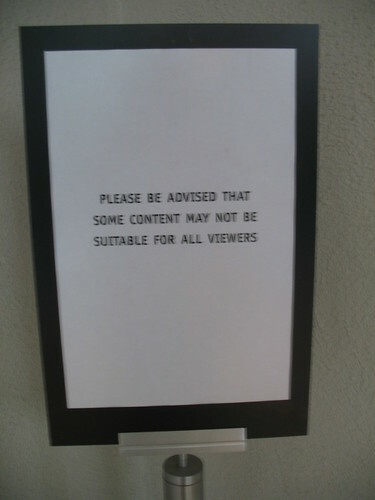 I spent much of the exhibit saying, "Ugh!" while simultaneously thinking, "Wow!" In terms of method, I marveled at the precision of all the cut paper. Seriously cool. 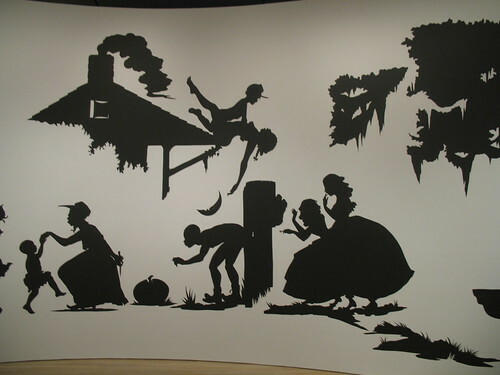 In terms of message, Walker's exhibit challenged me to see beyond unsettling silhouettes and to ask myself just why the silhouettes were unsettling. After enriching our minds, we went to enrich our tummies. Diddy Riese wasn't the only deliciousness tonight. tater was sporting her new Tory Burch Patent Thora Thongs. That ice cream sandwich looks so yummy. I'm drooling. Thanks for all the pics. Looks really interesting. I'm going to try to go see this soon. so much more concise, that monkey. ew, my feet are dry. 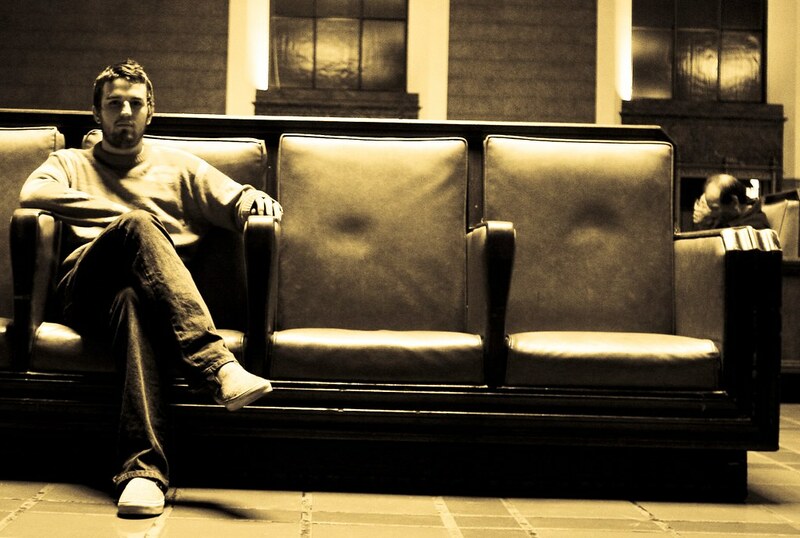 thanks again for keeping me company! 'twas fun. 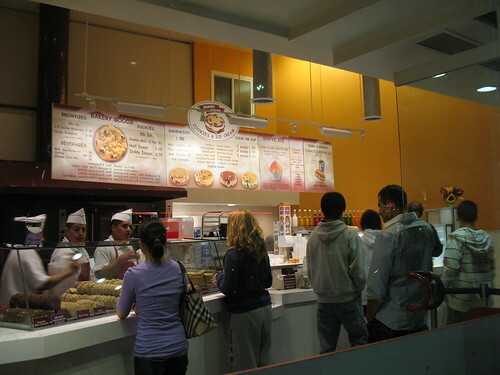 it's probably a good thing DR is so far from OC - that cookie thing looks yummy! I can't even comment on the art. All I can think about now is that ice cream sandwich!! My tummy just rumbled. i'm not even gonna front like i paid attention to the art (although i dug the fart). i FF'd right to the eats and the sweet sandals. 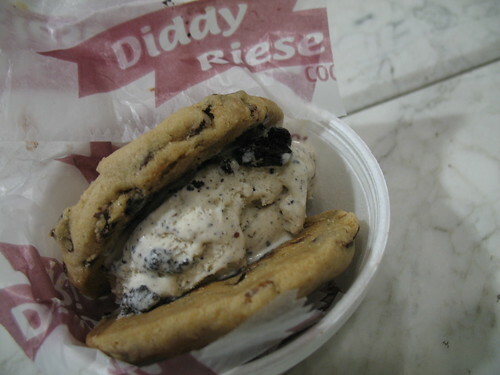 Hammer museum, Diddy Riese....it's almost like I'm *whisper* home. Looks like I missed out!! 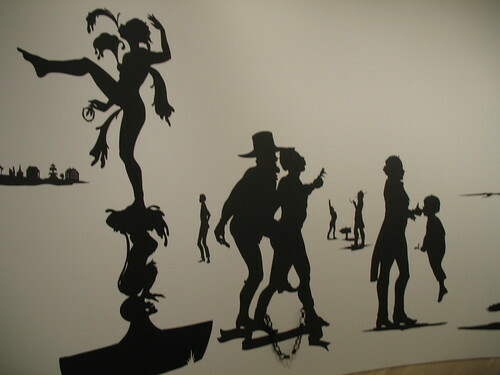 That exhibit reminds me of those art projects we used to do in elementary school where our teacher would trace our shadows. soooo weird. i drove by the hammer on thursday and decided i wanted to see the show. what a fun day!!!! man those cookies are to die for. We have had one and we have been craving them ever since. You are so lucky. And i loved the walls as well. they are so artsy. 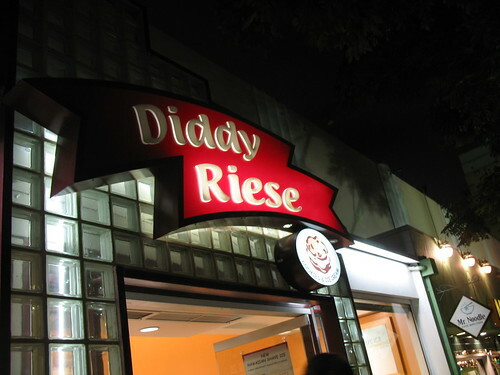 I have yet to try this Daddy Reese place but that treat looked so damn good that next time I'm in LA I think I'll stop by one. And wooo for those slippers! If my feet weren't so ugly I'd rock them! How fun! Sounds like great company. Once again you have crystallized my thoughts perfectly. No need for a full grown post of my own. 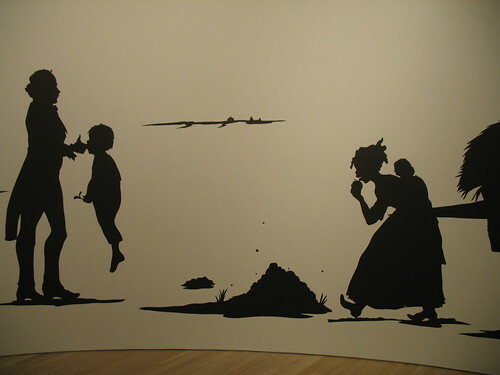 Kara Walker+Cookies=Fantastic. 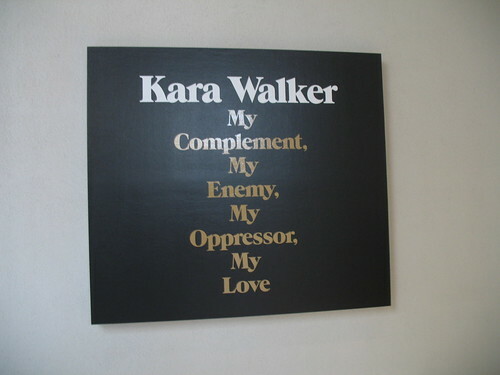 I first saw Walker's work at the Museum of the African Diaspora in SF. Can't wait to see her at the Hammer.